Sock specialist, Falke South Africa, is once again teaming up with outdoor adventure experts, Dirtopia, as the presenting sponsor of the popular full moon hikes held at Delvera Farm, just outside of Stellenbosch. April 19 marks the second last hike in the Full Moon hike series of this season. The event will be celebrating the Easter Hike with free Easter eggs for all hikers. The 9.75km circle route through the vineyards starts at the Trail Centre. 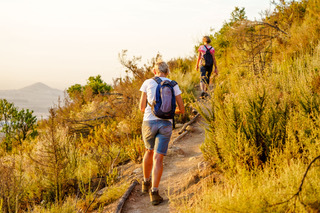 Guests are invited to enjoy a unique experience of hiking through the Greater Simonsberg Conservancy and Yellowwood forest, to the top of Klapmutskop where you can absorb the spectacular sunset and moon-rise which take place at 6.18pm and 6.44pm respectively. Starting from the Dirtopia Trail Centre, no later than 5.30pm, it will take approximately 90 minutes to reach the top. Hikers are advised to arrive as early as possible (4pm – 6.30pm) to get the full experience. Farm vehicles are available to transport children and elderly hikers to the start of the shorter 4,5km route from the famous Pepper Tree. The cost is R150 for adults and R50 for children under the age of ten and includes shuttles, permits and a map. Wear comfortable hiking shoes and socks. Falke AH2 Cool or AH4 Wool is ideal for this Full Moon Hike. Torches (which are also for sale at Trail Centre) and something warm to wear are recommended for the walk down. Bookings should be made in advance to avoid disappointment as space is limited. Walkers are welcome to pack their own picnic to enjoy on top of Klapmutskop, but the restaurant on the farm will be open late to order food or drink on your return to the Trail Centre. Tickets are available online via the website – www.dirtopia.co.za. For enquiries, call 021 884 4353. The latest Falke running, cycling and hiking sock ranges are available online at www.falke.co.za.